Published below a statement provided to us by the Federation of Trade Unions of Ukraine issued in protest at the latest round of cuts announced by the government. Thank you to our friends at the Union of Coal Industry of Ukraine (PRUP) for providing this translation. 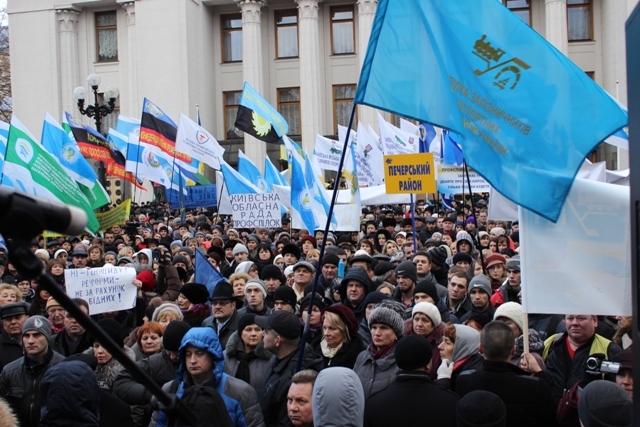 Unions took a continuation of the government policy of “belts-tightening” indignantly which has already become transformed into “indefinite shock therapy” for Ukraine among which more than three-quarters is the low-income groups, poor and indigent people. On the eve of International day of protection of human rights, on 9 December 2014 a crushing blow was delivered to millions of the most unprotected citizens such as pensioners, low-income families, teachers, doctors, culture workers and government employees. The blow was delivered by those to whom the above people ensure their regular wage and who pay their taxes in good faith. It’s already today the state social guarantees such as the minimum wage and living pension accounts for less than $80.00 do not fall short of $3.00 a day on certain UN level of poverty which is $5.00. The population of Ukraine’s revenue has decreased by three times lately. The shadow economy increased that resulted in absurd situation when 9 million of active people from 22 million are legal employed people who pay their taxes and fill social funds. Having forgotten about initial causes of the Revolution of Dignity which lead the current leaders of the country to the power, the new Government does not remember about the need of ensuring of employees constitutional guarantees and appropriate level of social protection for veterans and young people. The Government, without any public discussions, by another package of “saving” budgetary initiatives is planning to send “under the knife” all social rights guaranteed by the Constitution of Ukraine such as free medical aid, education, pension provision and benefits which were not canceled even by the previous regime. As one of the tree sides of the social dialogue at the national level we have to state that “anti-crisis” initiatives were developed with the gross violation of laws of Ukraine and General Agreement without public discussions and without an allowance for the unions’ position. Why do common people who are supposed to calculate their honestly earned kopecks from one wage to another one have to pay for long-expected reforms of the newly-made Government, and the oligarchs again get preferences and exceeded revenues at the expenses of rising prices and rates for the essential goods and services?! We understand that currently the country is in a state of military conflict in the East but it is inadmissible to transfer the entire heavy load exclusively to the shoulders of working population! The country problems solving can’t be fulfilled only at the expenses of “shaking out of pockets” of common working people (teachers, doctors, culture workers, government employees, social workers, etc.). The major part of unpopular limitations could be avoided by the power, making oligarchs share their excessive revenues which have been received lately especially under the umbrella of the previous regime. The difficulties of crisis and reforms in the democratic country should be shared fairly among the state, business and people. And each of them should be responsible for its area. If the load of cares and a burden are carried only by people therefore the democracy has not reached Ukraine yet. The Union Community strongly objects drastic methods of the power regarding liquidation / elimination of the definite rights and guarantees by law. The Unions demand from the Government to remember civilized, European way of the state decisions creation, i.e. begin consultations together with employers and unions without delay in order to analyse available resources in economy, use alternative sources of budget filling, proceed to the removal of 4.5 mln illegal employees from the unlawful use, de-shady more than 2,000,000,000.00 of wage that can bring not les than 100,000,000.00 additional earnings to the budget, Pension and other Funds. In the judgment of the unions such arrangements should be s follows: introduction of the wealth tax, extension of the rent taxation, increase in dividends tax, introduction of gross revenue tax of large-scale enterprises to ensure of the country’s defense capacity, increase in the unhealthy goods excise tax, utilization of counteraction against tax evasion mechanisms, sale of ineffective and unprofitable state property, declaration not only revenues but also charges. 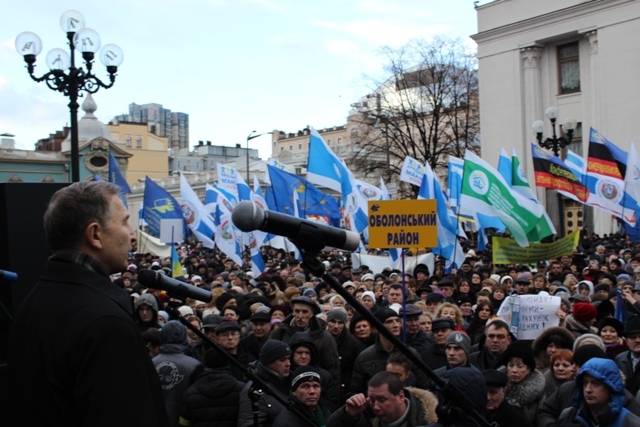 At the same time it is necessary to determine clear state policy on the implementation of the fair remuneration of Ukrainian people labor which at last should eliminate poverty among people in work, reduce the gap in wages compared to the neighboring countries, as well as ensure a high population effective demand for domestic product that is the most essential thing to overcome the economy crisis and unemployment. We state that Unions will use all available rights and opportunities to protect an employee and we warn short-sighted officials and government men about their legal liability and citizens of Ukraine responsibility! WE ARE CALLING THE GOVERNEMENT AND DEPUTIES – TAKE CARE OF YOUR PEOPLE, ASK THE ADVICE OF PEOPLE, AND ONLY THEN YOU WILL DESERVE TO BE DEMOCRATIC, POPULAR POWER!